Source: Symantec's Medium blog "Security Response"
Fraud campaigns during tax season are nothing new, but according to the VP and country manager for Symantec Canada, it’s at an “all-time peak” in Canada, and fraudsters have fallen in love with a new tool: Bitcoin. “We’re seeing dollar amounts between $1,000 to $10,000 being stolen in each case,” says Ajay Sood. “Bitcoin machine operators [in Toronto] are telling us that almost every person coming in to use Bitcoin, are using the machine to pay their taxes. The majority of these fraudulent calls begin the same way. Someone posing as a Canada Revenue Agency agent calls you and says your taxes were filed incorrectly, you owe them money and that you need to transfer money over to them immediately. The fear tactics ensue, and victims are often told they may be faced with a serious fine, or worse, jail time, if they don’t act quickly. But more recently, victims are no longer being asked to use their credit card to transfer the money, but instead, are directed to withdraw money from their bank accounts, visit a nearby Bitcoin machine and deposit the money into the system. The machine converts the cash to Bitcoin – currently valued at approximately $11,000 CAD – and transfers the funds to the caller. It’s next to impossible to trace, explains Sood. 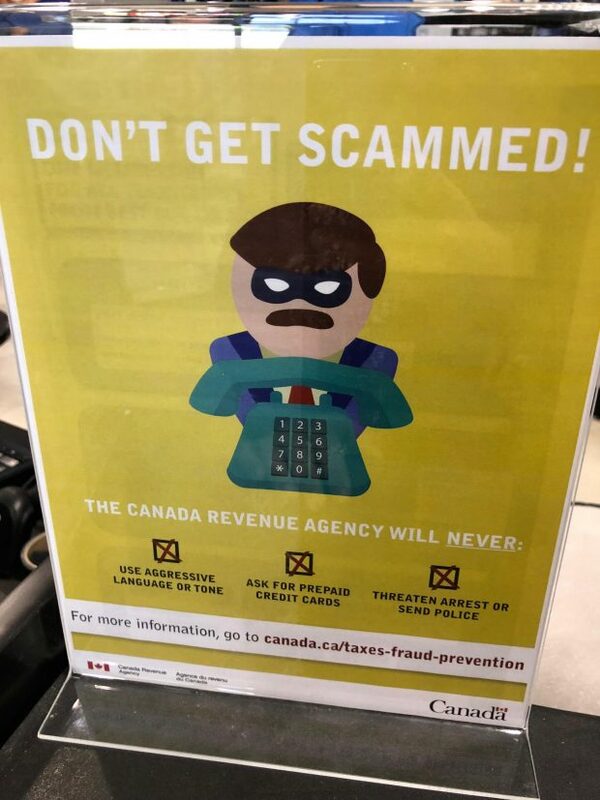 A CRA poster located downtown Toronto, warning people not to fall for scam tactics during tax season. According to the Canadian Anti-Fraud Centre, only 5 per cent of victims actually report tax fraud crimes. Submitted. Toronto Police issued a statement January warning residents of a fake CRA scam that asked people to pay taxes with Bitcoins. “Police are reminding people that the CRA does not ask for Bitcoin payments, send QR codes to request payments or send police officers to arrest people for immediate non-payments,” the statement read. Technology isn’t going to help reduce this type of crime, says Sood, only education will. “It’s hard for a technology-based solution to solve this. I can’t stop you from going to a Bitcoin machine and putting in money,” he says. But unfortunately, the situation might only get worse before it gets better, according to Sood. Attackers don’t need to be tech savvy anymore, and with Bitcoin entering the equation, it makes it that much easier for scammers to grab the cash and disappear. When it comes to software such as TurboTax and StudioTax, Canadians shouldn’t be worried about using them, says Sood. ITbusiness.ca contacted several convenience stores with Bitcoin machines, requesting comment on this story. As of the story being published, none had responded.